Computer Networking course is designed to enable participants to install, configure and test a fundamental computer network. The opportunities for employment within the area of network support are enormous as businesses continue to grow and utilise the new technology available to them. This is a vital role to ensure the smooth running of businesses reliant on their network and IT systems. This course provides learners with both the practical and theoretical knowledge of networks. During the course, participants will learn about the different components used to create a network including hardware, software and topologies. Course runs over 5 days next course commencing Saturday 9th November 2019. View our course schedule and here for fees and booking. Network features, hardware and software components. Network topologies, technologies and communication protocols. Peer-to-peer and server based networks including: – servers, clients, peers, shared resources, operating systems, administration, security, central support systems. OSI layers (Open Systems Interconnection), MAC address, sub-netting. Internet access technologies: – DSL, Broadband (ADSL), PSTN (dial-up), Satellite, Wireless. Selecting cable or wireless systems for connection. Hardware components for a peer-to-peer network including: – interface cards, hubs/switches, cables, connectors, tools and anti-static equipment. Virus protection, firewalls and passwords, security measures, file management and access rights. 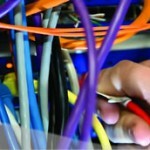 City & Guilds of London Institute “Install, Configure and Test ICT Networks” (Examination No. 7266/7267-408). This examination consists of 2 practical assignments. 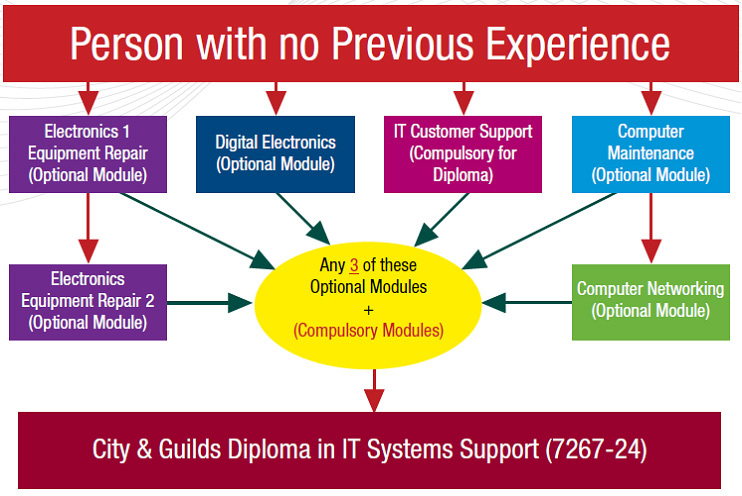 The qualification can be used as part of the requirement for City & Guilds Diploma in IT Systems Support (7267-24). Electronics Equipment Repair 1, Electronics Equipment Repair 2, Digital Electronics, IT Customer Support, Computer Maintenance.